KEEP YOUR FEET WARM: Have you noticed how your feet are always cold, even if the rest of your body is covered and way too warm? The thermal socks are here to keep your feet warm during the whole day! The heat holders will trap the heat of your feet and keep your feet warm for longer. Try them on and see for yourself! 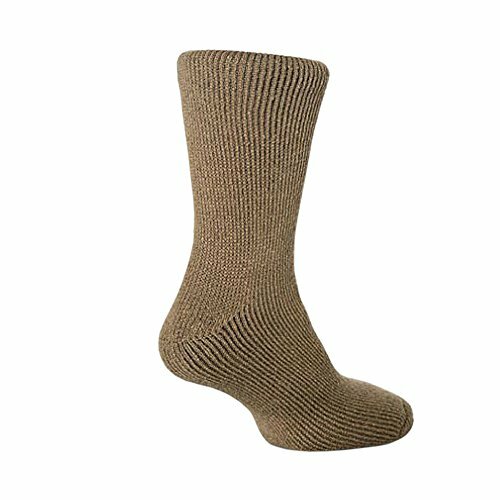 4.7 TOG RATING IS THE ULTIMATE HEATED SOCKS ON THE MARKET. 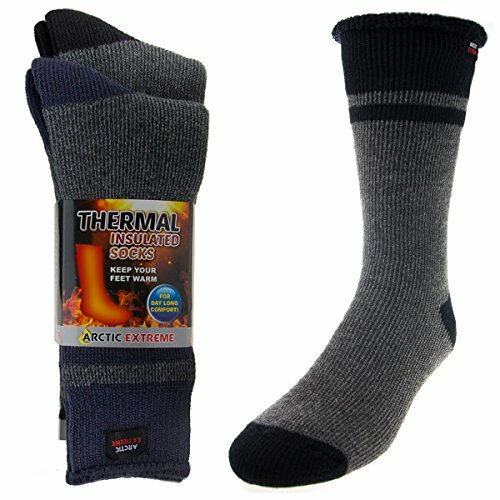 It has nearly five times more cold resistance than normal thermal socks. DESIGNED FOR EXTREME TEMPERATURES: 7X WARMER THAN REGULAR COTTON SOCKS! The insulated socks have been specially designed to keep your feet warm even when the temperature outside is way too low. The thermal compression socks are ideal for you if you work outdoors, if you go skiing or if you enjoy hiking and camping in the mountains during the winter. SNUGLY SOFT AND COMFORTABLE: The thermal boot socks are not only practical, but they're also unbelievably soft and cozy! 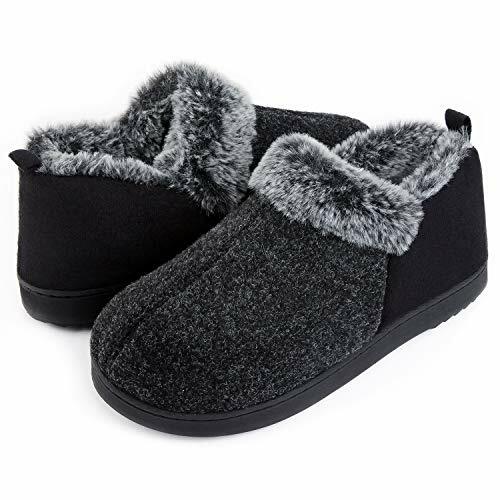 Wear them all day long and your feet will be snugly covered with the soft extra thick fabric. The crew socks will be very gentle with the skin of your feet and ankles and it will never irritate it nor make it itchy. YOU'LL HAVE THEM FOREVER: Get these thermal winter socks now and you'll never have to replace them with a new pair. And why would you? The heavy duty materials will always be soft an able to keep your feet warm! So wear the heat holders all the time and wash them as often as you have to. Nothing will ever happen to them! ONE SIZE/6 PAIRS: What size socks do you wear? The insulated thermal socks comes in standard sock size 9-11 and fits women's U.S. shoe size 5-10. In this way, your feet will be comfortable, your toes won't be restricted and the socks won't keep slipping. KEEP YOUR FEET WARM: Have you noticed how your feet are always cold, even if the rest of your body is covered and way too warm? The thermal socks are here to keep your feet warm during the whole day! The heat holders will trap the heat of your feet and keep your feet warm for longer. Try them on and see for yourself! 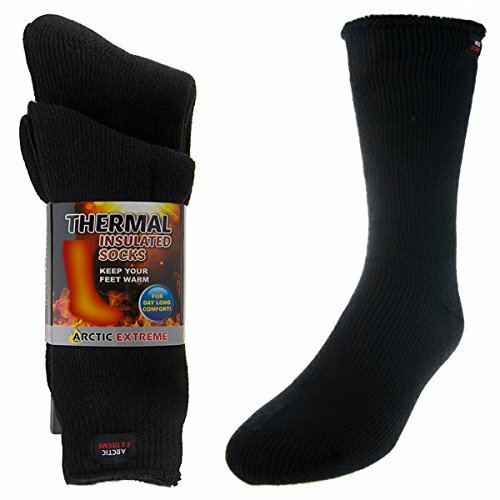 2.3 Tog Rating means it has nearly three times more cold resistance than normal thermal socks. 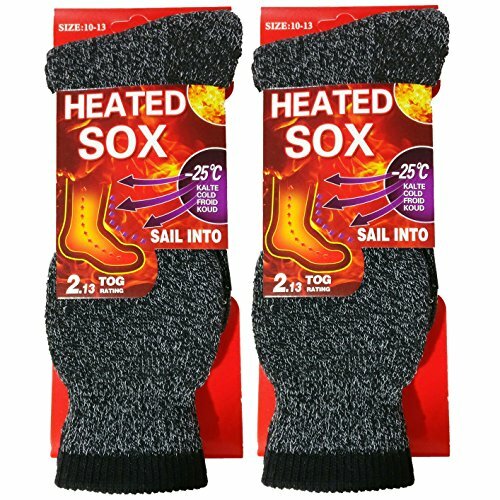 DESIGNED FOR EXTREME TEMPERATURES: 3X WARMER THAN REGULAR COTTON SOCKS! The insulated socks have been specially designed to keep your feet warm even when the temperature outside is way too low. The thermal compression socks are ideal for you if you work outdoors, if you go skiing or if you enjoy hiking and camping in the mountains during the winter. YOU'LL HAVE THEM FOREVER: Get these thermal socks now and you'll never have to replace them with a new pair. And why would you? The heavy duty materials will always be soft an able to keep your feet warm! So wear the heat holders all the time and wash them as often as you have to. Nothing will ever happen to them! ONE SIZE/ 6 PAIRS: What size socks do you wear? 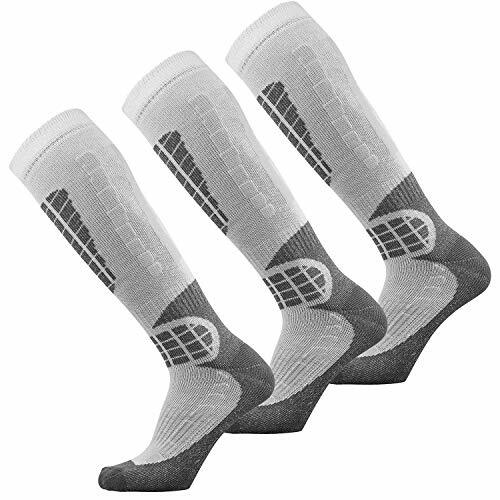 The insulated compression thermal socks comes in standard sock size 10-13 and fits men's U.S. shoe size 8-13. In this way, your feet will be comfortable, your toes won't be restricted and the socks won't keep slipping. 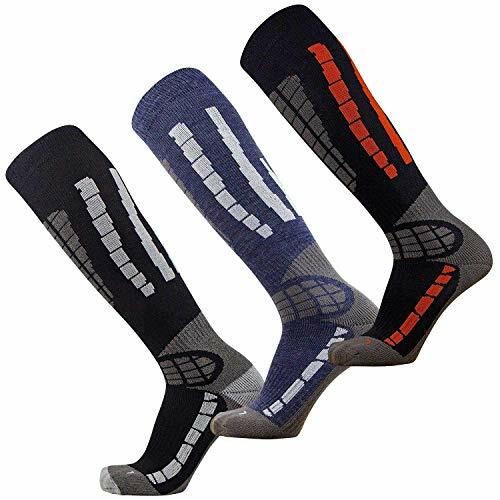 6-pack includes 4 black, 1 navy, and 1 grey thermal socks. ONE SIZE/ 6 PAIRS: What size socks do you wear? The insulated compression thermal socks comes in standard sock size 9-11 and fits women's U.S. shoe size 5-10. In this way, your feet will be comfortable, your toes won't be restricted and the socks won't keep slipping. 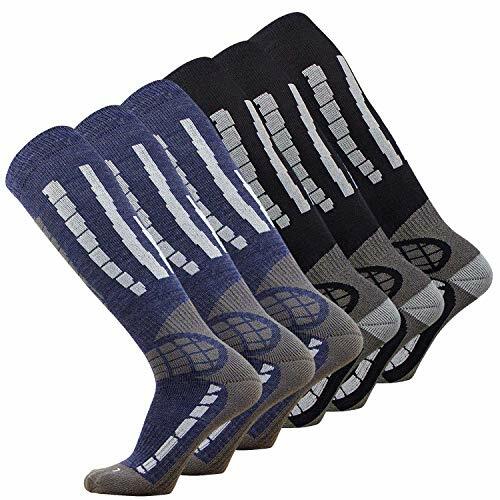 6-pack includes 4 black, 1 navy, and 1 grey thermal socks. DESIGNED FOR EXTREME TEMPERATURES: 7X WARMER THAN REGULAR COTTON SOCKS! The insulated socks have been specially designed to keep your feet warm even when the temperature outside is way too low. The thermal warm socks for men are ideal for you if you work outdoors, if you go skiing or if you enjoy hiking and camping in the mountains during the winter. ONE SIZE/6 PAIRS: What winter socks size do you wear? 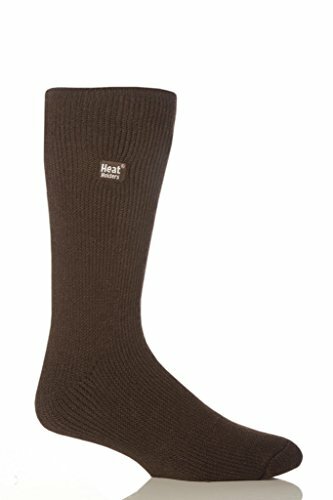 The insulated thermal socks comes in standard sock size 10-13 and fits men's U.S. shoe size 8-13. In this way, your feet will be comfortable, your toes won't be restricted and the socks won't keep slipping. 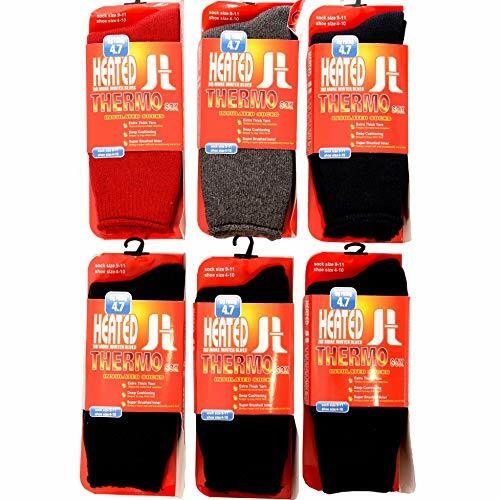 6 pack includes pairs of black, royal blue, red, light grey and/or dark grey heavtweight thermal winter socks. 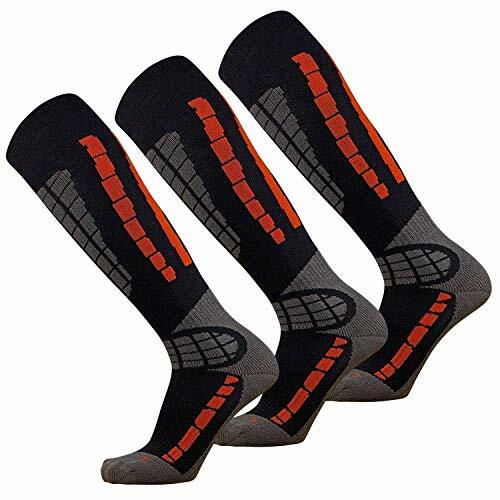 These thermal socks for men are your best choice of feet warming socks with its heavyweight fabric construction. Great hiking socks for extreme weathers. Sock Features: - Wool/cotton blend for maximum comfort and warmth. - Non ravel top ensures maximum stay up. - Durable Construction for long lasting wear. - Arch support helps stabilize and support your foot. - Full cushion for all day comfort. Specially designed to have exceptional heat retaining properties. Superiour double layer insulation guarantees to keep your feet warm and comfortable in the coldest temperatures. Ideal for snow activities such as skiing, snow boarding, ice skating etc. 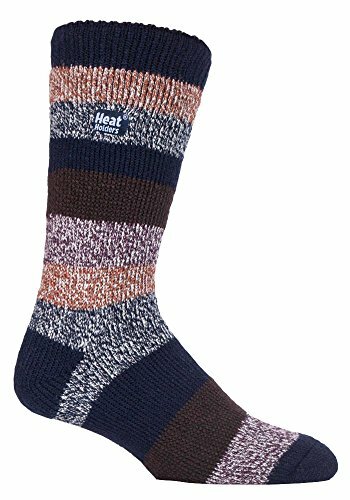 These thermal socks for women are your best choice of feet warming socks with its heavyweight fabric construction. Great hiking socks for extreme weathers. NON-SKID GRIP SOLE: Your kid will love wearing our plush fuzzy socks! Our comfortable grip kids socks feature a non-slip bottom, making it practical and kid-safe for wear on slippery floors. 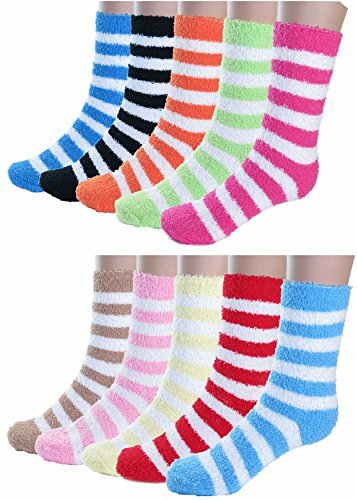 These cozy non skid socks for kids have grippers on the bottom making it perfect for everyday lounging around the house. VALUE PACK!! Our fuzzy slipper socks for kids are availablein pairs of 6, in 2 styles and varied sizes. We offer fuzzy socks for girls, boys, toddlers, and baby. WARM & COZY: These kids slipper socks are what your kid needs to feel warm and relaxed all winter round! Our no skid winter socks can be worn for additional layering under boots for extra warmth. PLUSH AND COMFORTABLE: Our comfy grip socks for kids are ultra-soft, keeping those little toes snuggly and warm during the cold winter months. Our sock slippers for kids feature an excellent elastic top that does not constrict circulation, and plush cushioning that your little ones will love wearing. 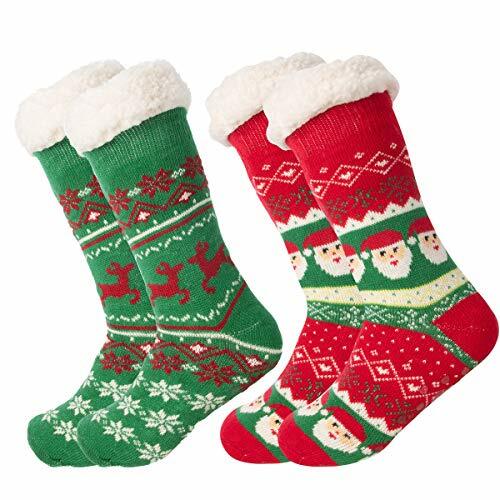 GREAT GIFT IDEA: These kids fuzzy socks make a great holiday gift! Get our non skid socks for kids as a Christmas gift for your family and loved ones. Fits Men's shoe size US 7-12 or Women's shoe size 8-13. 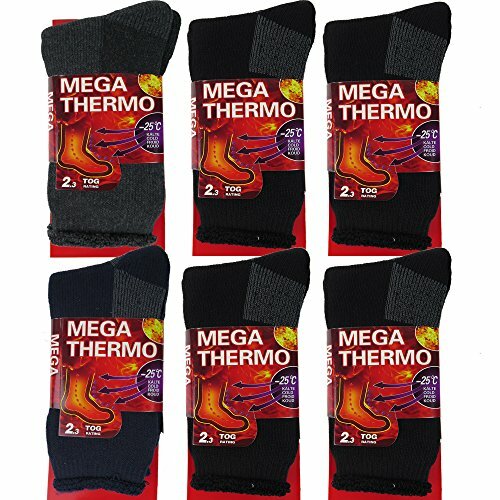 USBingoshop Heat Supreme Thermal Socks Design for Winter Cold Weather! The thermal socks are here to keep your feet warm during the whole day! The heat holders will trap the heat of your feet and keep your feet warm for longer. 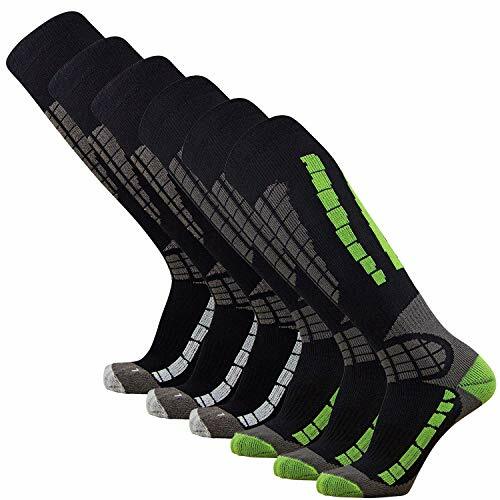 Size: The insulated compression thermal Socks Size 10-13 / Fit Shoes Size 6-12. The open design for your feet will be comfortable, toes won't be restricted and the socks won't keep slipping. Material: The special Acrylic Yarn Gives Thick Thermal with Light Weight. (1.8 Tog with Wool, 2.3 & 4.7 Tog without Wool). The thermal boot socks are not only practical, but they're also unbelievably soft and cozy! Style: Extra Thick Yarn, Deep Cushioning and Super Brushed Inner! The style is perfect for you work outdoors, skiing, hiking and camping in the mountains during the winter. 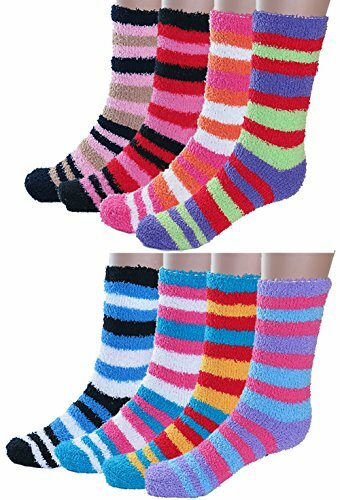 FLUFFY SOCKS: Enjoy extra warmth and comfort with these warm fuzzy socks for women! 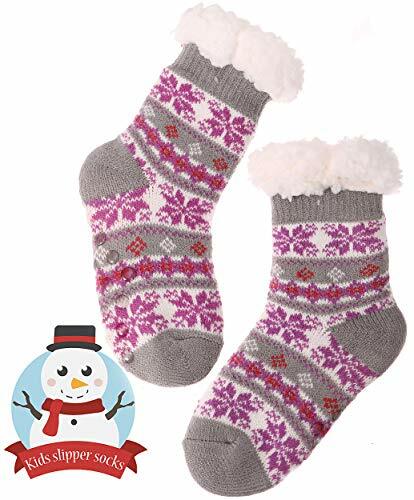 Made of ultra soft and stretchy material, these womens fuzzy socks are most comfortable and will keep your toes cozy and snuggly during cold winter months. FOR WOMEN: Size 9-11; fits women's shoe size 4-8. Measures approximately 7 inches from heel to top. Crew style fuzzy socks girls ; hits around mid-calf. COMFORT LOUNGING SOCKS: Made of warm and ultra soft material, our comfy socks are perfect for wear during the cold winter months. Enjoy girls fuzzy socks! GREAT GIFT!! 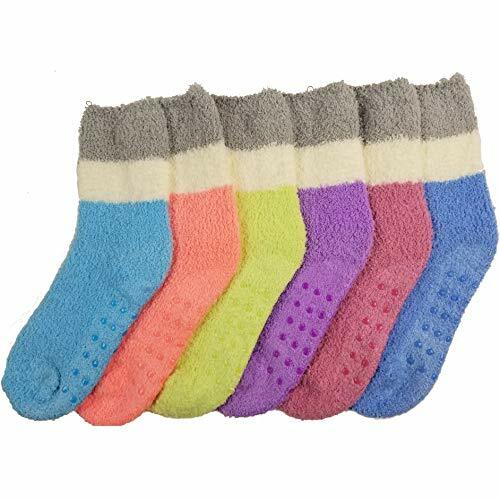 Get her a pack of these plush cozy socks as a holiday gift, birthday gift, or Valentine gift and she'll feel the warmth all winter long of fuzzy sock ! 6 pairs assorted colors as displayed. 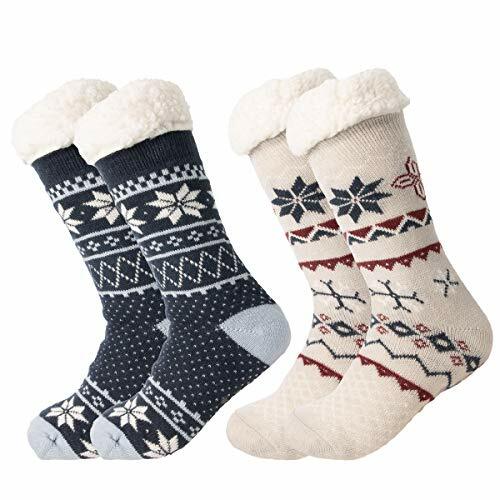 FLUFFY SOCKS: Enjoy extra warmth and comfort with these non skid fuzzy winter socks! 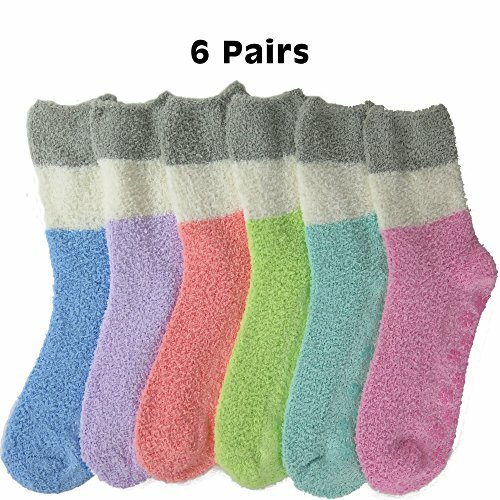 Made of ultra soft and stretchy material, these womens non-slip fuzzy socks are most comfortable and will keep your toes cozy and snuggly during cold winter months. 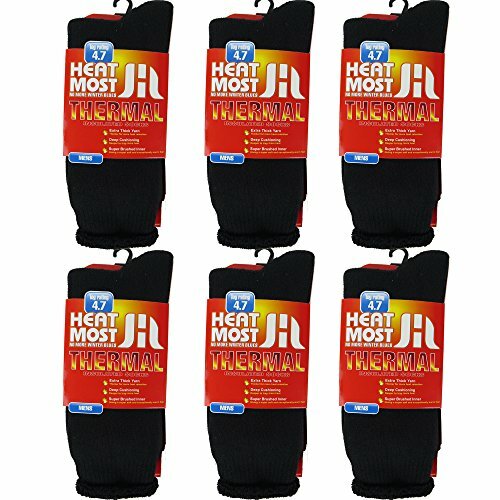 FOR WOMEN: Slip resistant socks size 9-11; fits women's shoe size 4-8. Measures approximately 7 inches from heel to top. Crew style; hits around mid-calf. COMFORT LOUNGING SOCKS: Comfy socks are non slip with silicone grippers on bottom, safe for wear on indoor finished floors around the house or hospital. GREAT GIFT!! Get her a pack of these plush nonslip cozy socks as a holiday gift, birthday gift, or Valentine gift and she'll feel the warmth all winter long! 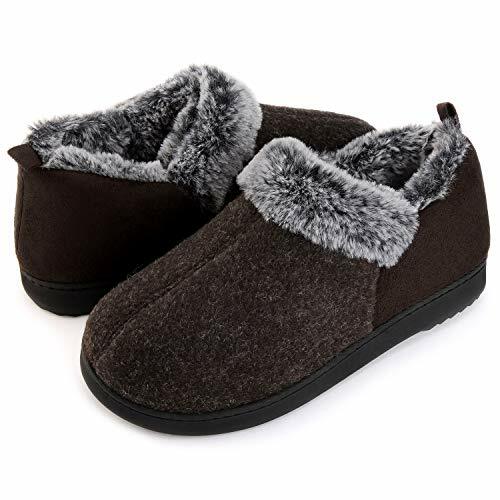 FROM BEST SELLING SLIPPERS BRAND ULTRAIDEAS on Amazon, the slippers are quality & reliable with 100% no risk money back guarantee & 1 year warranty & 24/7 after-sale service. ★ Treat your feet and grab a pair now! Merino Wool to Prevent Odor: Anti-odor properties help to prevent bacteria from forming in the ski socks, keeping feet feeling fresh. Moisture wicking technology ensures your socks don't get heavy with perspiration or wet from snow. Feet feel great all day while skiing. 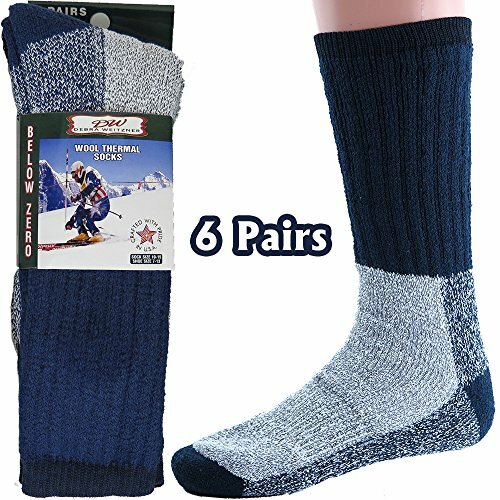 HIGH COTTON CONTENT KEEPS FEET WARM --- Made of premium Cotton (86.1% Cotton,12.2% Chinlon,1.7% Spandex), the ski socks are designed to keep feet warm. Enjoy your day skiing or snowboarding without having to worry about having cold toes. 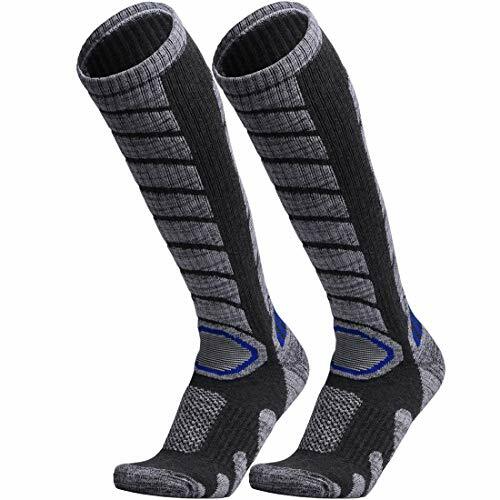 MIDWEIGHT and TECHNICAL DESIGN --- No only do the ski socks feature a stylish design, they are also engineered with advanced technology to provide the perfect fit. They are a midweight thickness, providing the perfect blend between comfort without effecting the fit of your ski boot. DESIGNED FOR ALL DAY COMFORT --- The selected cotton in the ski socks is moisture wicking, preventing any buildup of sweat. They are also breathable and thermal regulating, keeping feet at the perfect temperature. BUY FROM A TRUSTED BRAND --- At WEIERYA, we are experts in ski socks. We are manufacturers of many of the bestselling men's ski sock and women's ski sock styles. Don't take our word for it, read our customer reviews and try our ski socks. We know you will love them. GUARNTEED FOR LIFETIME --- We take great care in making each Ski Sock. They are designed to last season after season. If for any reason the ski socks don't perform how they should, we will send you a replacement at no charge. Slim fit, soft and comfortable. 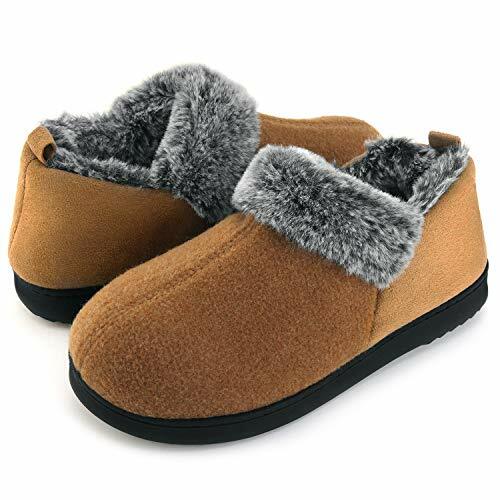 ECO MATERIALS & NON-TOXIC : The kids slipper socks is blend of premium natural materials, all the materials are NON-TOXIC & ECO MATERIALS, It's 100% safety for your lovely children . 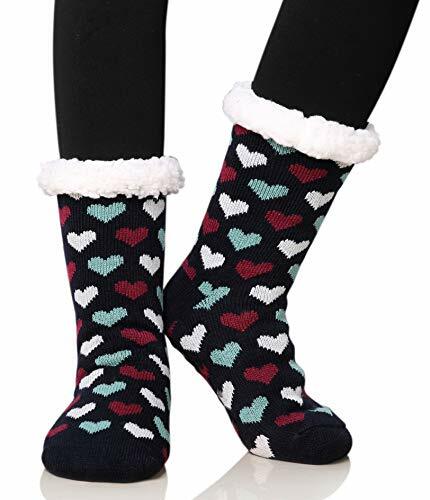 WARM & COZY & SOFT : The materials for this stylish kid slipper socks are very comfortable and soft, no itching issue, special fuzzy inner design will keep the feet warm, the soft and thicken fabric will keep your feet feel comfortable all the day. It's a perfect slipper socks for boys or girls. ANTI-SLIP DESIGN: The socks are great to wear as slipper socks playing around the house, slip-resistant gripper dots design at the bottom of socks will help keep your loved kids safe by reducing the risk of falls & injuries while keeping them nice & warm & cozy. 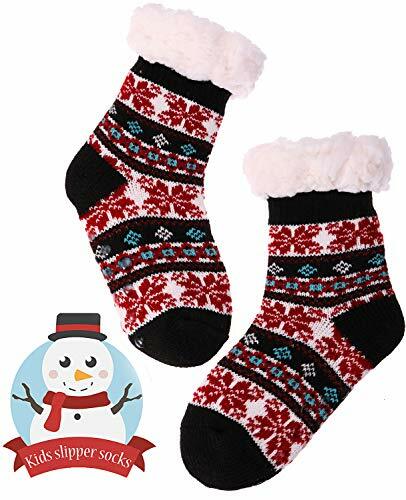 FIT MANY OCCASIONS : The high quality slipper thermal socks are suitable for different situation, you can wear them as home socks, christmas socks, slipper socks, boot socks, funny socks, thermal socks, house socks, sherpa socks, novelty socks, fleece lined socks, sleeping socks, cabin socks in Spring, fall, winter season or in any cold weather or snow areas! 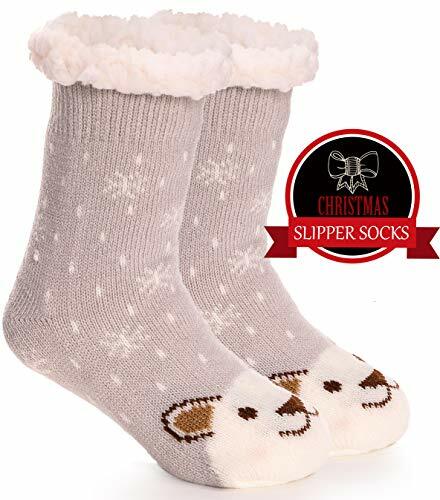 BEST GIFT OPTION : This winter slipper socks make the perfect present for kids, you could also choose it for your daughter, son, kid, friends as birthdays gift or as christmas stockings, white elephant gift, christmas gift, birthday gift, christmas stocking stuffer, halloween gift. 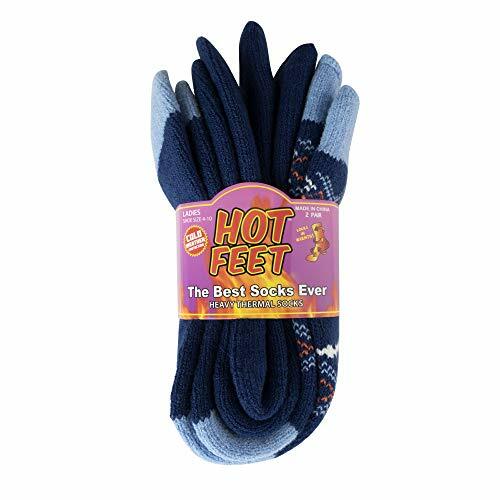 SOFT & BREATHABLE & COZY : The materials for this stylish kid socks are very comfortable and soft, special fuzzy inner design will keep the feet warm, the soft and thicken fabric will keep children's feet feel comfortable all the day. 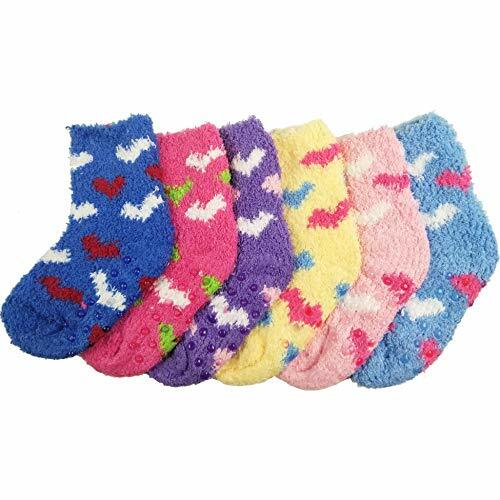 , no any itching issue, It's a perfect socks for boys or girls. 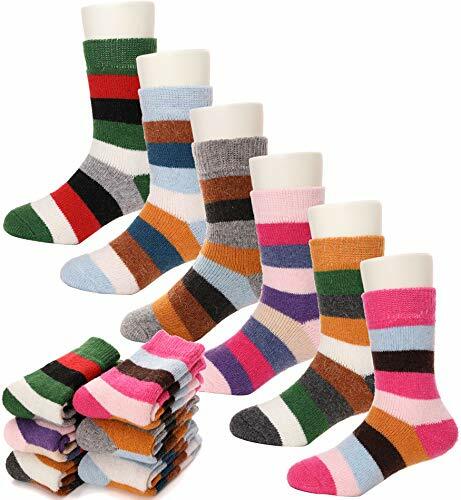 DIFFERENT SIZE FOR AGES : This fashion children socks design for different age (from toddler socks to teen age socks), We offer variety of size for your choice, 1-3 Y, 4-7 Y, 8-12 Y . 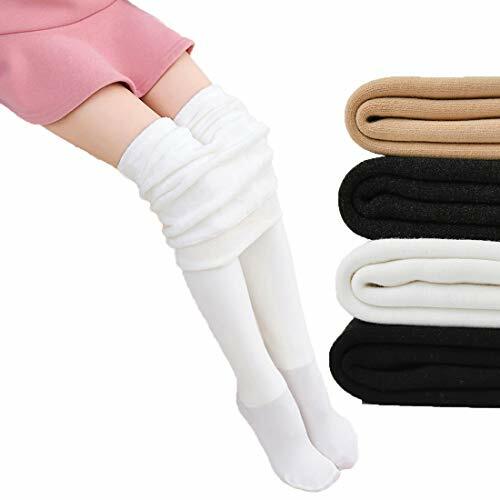 FIT MANY OCCASIONS : The high quality wool thermal socks are suitable for different situation, you can wear them as school socks, outdoor socks, home socks, christmas socks, slipper socks, boot socks, funny socks, thermal socks, microfiber socks, house socks, cozy socks, sherpa socks, novelty socks, fleece lined socks, sleeping socks, cabin socks in Spring, fall, winter season or in any cold weather or snow areas! 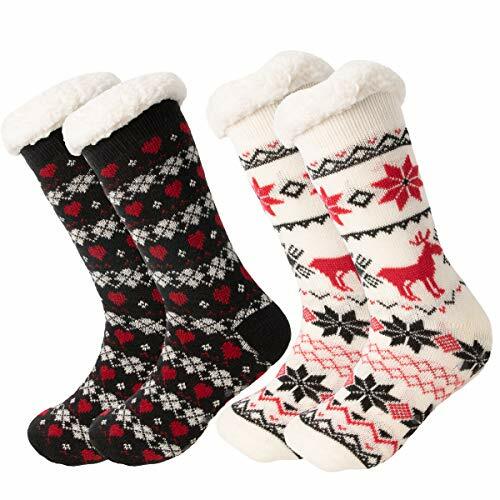 BEST GIFT CHOICE : This winter wool cotton socks make the perfect present for hikers, outdoor walkers, you could also choose it for your daughter, son, kid, friends as birthdays gift or as stocking stuffer, white elephant gift, christmas gift, birthday gift, christmas stocking stuffer, halloween gift. 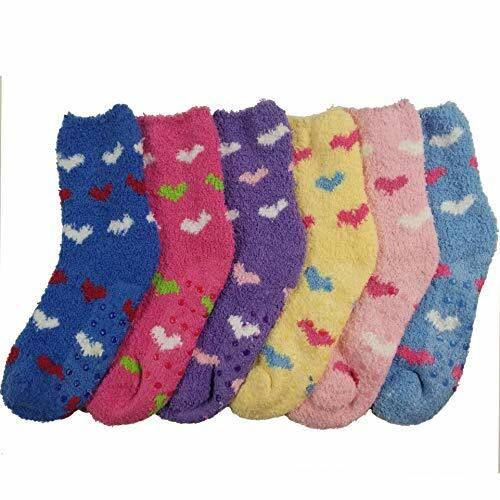 NON-TOXIC & ECO MATERIALS : The kids slipper socks is blend of premium materials, all the materials is NON-TOXIC & ECO MATERIALS, It's 100% safety for your lovely children . 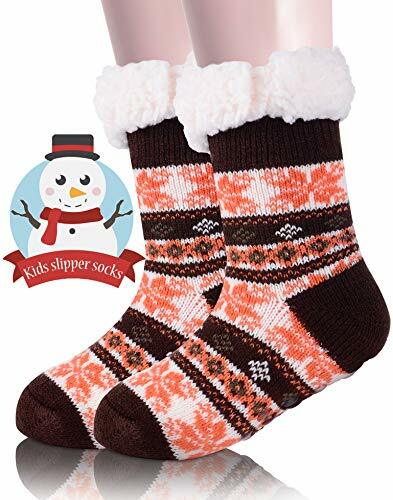 SOFT & THICK & COZY : The materials for this stylish kid slipper socks is very soft and comfortable, special fuzzy inner design will keep the feet warm, the soft and thicken fabric will keep kid's feet feel comfortable all the day. ANTI-SLIP & SAFETY: The socks are great to wear as slipper socks playing around the house, slip resistant gripper dots design at the bottom of socks will help keep your loved kids safe by reducing the risk of falls & injuries while keeping them nice & warm & cozy. 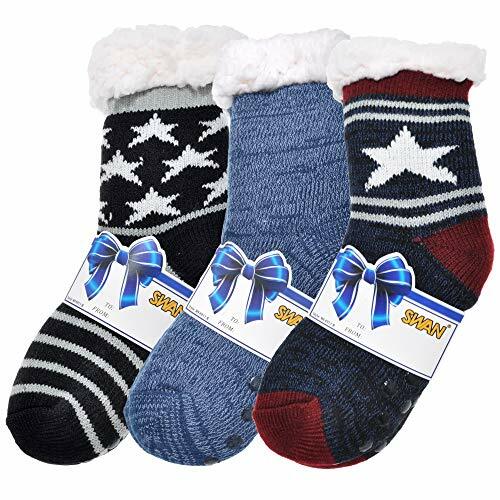 MULTI-FUNCTION : The high quality kid thermal slipper socks are suitable for different situation, you can wear them as cabin socks, indoor socks, home socks, knit socks, ragg socks, Fleece lined socks, boot socks, fuzzy socks, christmas socks in Spring, fall, winter season or in any cold weather or snow areas! 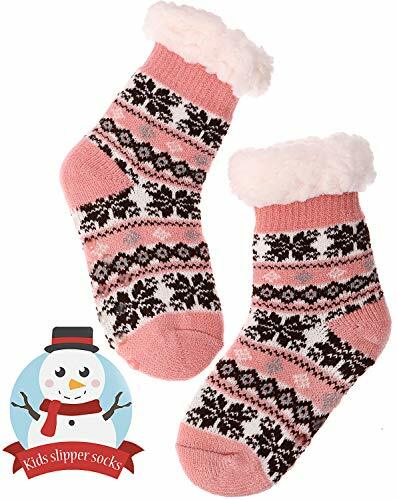 BEST GIFT CHOICE : This winter slipper socks make the perfect present for boys girls child or toddlers, you could also choose it for your daughter, son, kid, friends as birthdays gift or as christmas stocking stuffer, white elephant gift, christmas gift. Machine wash in lingerie laundry bag, line dry. For better results, hand wash.
FROM BEST SELLING SLIPPERS BRAND ULTRAIDEAS on Amazon, the slippers are quality & reliable with 100% no risk money back guarantee & 1 year warranty & 24/7 after-sale service. ★ Tip: Please get ONE SIZE UP if you wear a half-size (e.g. 7.5, 9.5) or tend to wear thick socks with slippers ★ Treat your feet and grab a pair now! 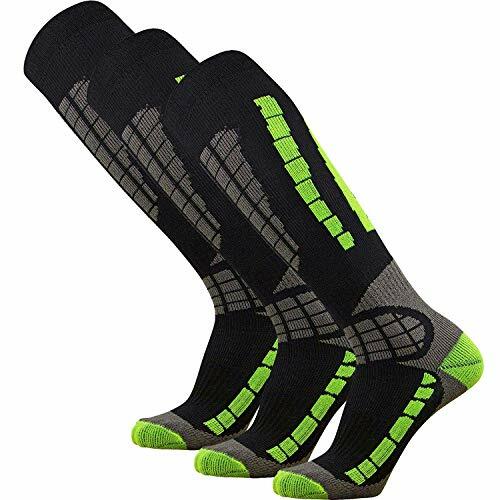 Lightweight material: Not too thick, the light material allows the ski socks to fit comfortably in ski boots without altering the fit of your ski boots. Soft and Comfortable Material: The ski socks feel great against the ski while skiing thanks to the highest quality yarn we use. They feature an ultra-comfortable sole. Anti-odor properties help to prevent bacteria from forming in the ski socks, keeping feet feeling fresh while moisture wicking proprieties ensure your socks don't get heavy with perspiration or wet from snow. Feet feel great all day while skiing.